The Yupiteru MVT7100 is a broadband scanner with a range of 530 kHz - 1650 MHz in AM, wide- and narrowband FM and LSB/USB. For NBFM, the Yupiteru MVT-7100 uses a TA31136, with the baseband signal at pin 9. 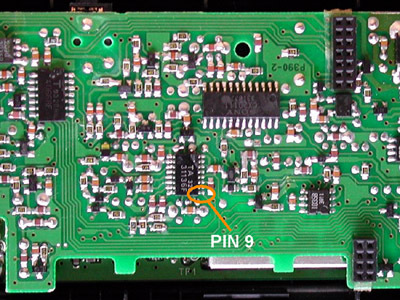 This IC is located on the IF PCB. This PCB is visible when the scanner is opened. A 'safety resistor' of 10 k is soldered to the TA31136. Its pin is bent to follow the IC's pin exactly. Then, the resistor is connected to pin 9 of the IC using a fine tip soldering iron and a minimum amount of solder. The resistor is fixed to the IC with a drop of glue from a glue gun. This prevents damage to the IC pin when inadvertedly mechanical stress is applied to the resistor. 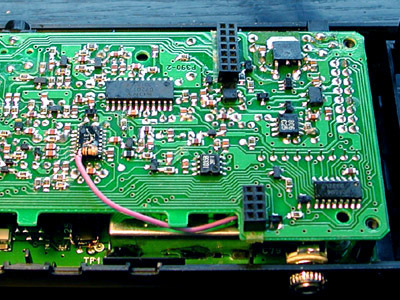 The 3.5 mm chassis part is mounted in the lower half of the scanner, below the IF PCB, as there is more clearance between the PCBs there. To disassemble the IF board, remove the two screws at the bottom end of the PCB. Remove the volume, squelch and dial knobs and loosen the washers with a pair of fine tip pliers. Now you can take apart the PCB. The chassis part's ground lug is connected to the metal shield nearby. 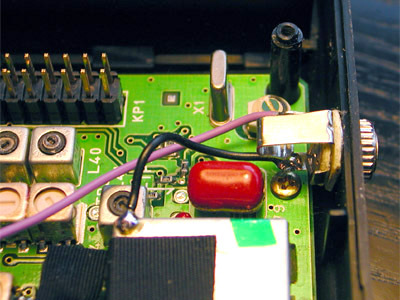 The inner conductor is connected to the 10 k resistor mounted on the discriminator IC with a small piece of insulated wire. If you want to use this scanner for AIS: the MVT-7100's IF filter is a bit too narrow for a 9600 bit/s AIS signal. This is great for FM selectivity, but it impedes AIS reception quality. It may help to tune the receiver slghtly higher or lower than the nominal AIS frequency in 1 kHz steps.